Made from the most gentle of medicinal-herbal ingredients, Bee Loved Body Lotion is incredibly kind to sensitive skin, soothing dry skin problems such as eczema, psoriasis and dry or flaky skin. It is very safe to use in pregnancy, bringing relief to itchy, dry and cracked skin feeling the effects of an expanding bump and massive hormonal changes. 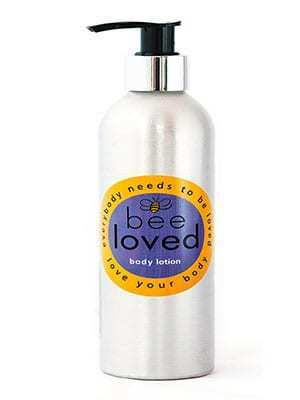 Packed with vitamins, minerals and essential fatty acids that are absorbed through the skin and used by the body just as if they were eaten, Bee Loved Body Lotion is a healthful tonic for your body as well as your skin. It has a light, creamy texture, is easily applied and dries quickly so it won’t stick to your clothing. With a soothing blend of aloe butter, lavender oil, chamomile, shea butter, cocoa seed butter and rosemary extract, Bee Loved Body Lotion nourishes dry skin while forming a protective, breathable barrier to maintain hydration and optimal skin health. Aloe butter is rich in anti-oxidants, stimulating the skin’s circulation to preserve its natural moisture. Packed with protein, enzymes, amino acids, polysaccharides, minerals and antioxidants beta carotene and Vitamin A, C and E, Aloe’s nutrient-dense health-giving effects include the acceleration of burns healing, prevention of wrinkles and softening of dry, taught skin. Lavender Oil adds a calming, subtle fragrance to Bee Loved’s Body Lotion and is full of potent antioxidants that help fight the build-up of free radicals caused by environmental toxins. Chamomile is well known for its anti-inflammatory properties and quickly calms and soothes angry, red skin. Rosemary provides a good source of iron, calcium and vitamin B6 that when absorbed through the skin can support the immune system as well as the development of collagen and reduction of free radicals. It is also packed with manganese which is well known to help reduce wrinkles and reduce the signs of ageing. Rosemary oil is also known to kill bacteria, fungi and viruses on the skin, and combined with properties that encourage cell rejuvenation, it is ideal for sufferers of dermatitis, acne, eczema or psoriasis. Cocoa seed butter provides relief to irritated, angry skin while creating a protective barrier on the skin to guard against moisture loss. Shea butter is packed with vitamins A, E and F, fatty acids and even offers SPF 6 UV protection, and is a powerful moisturiser for dry skin. Research shows shea butter is a powerful anti-inflammatory and supports the skin’s collagen production, softening skin and helping to reduce wrinkles.